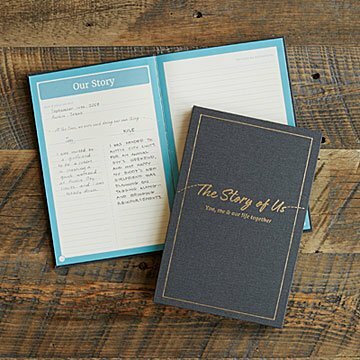 Taking you through special moments big and small, this fill-in journal tells your unique love story. There once was a couple that went on a fantastic adventure together: life. Starting with the day you met and taking you through cherished moments big and small, this fill-in journal tells your unique love story. It's divided into ten sections, which all include prompts and photo corners: Write down memories and share pearls of wisdom, and add pictures that'll take you right back to a special time or place. Complete the linen-bound book and give it to your partner as a gift, or fill it out together to create a keepsake you'll want to read on every anniversary—or whenever you've got that loving feeling. Made in San Antonio, Texas. 72 photo corners are included to allow for mounting of your keepsake photos. I love the content of this journal. I bought it for a wedding I'll be attending this spring. After receiving it though, I decided not to gift it. The book was much thinner than I expected and it feels flimsy. The worst part is that there is NO SPINE! There is a front and back cover with exposed folds, threads, and glue. I was shocked, but even more shocked when I double-checked the product photos and noticed one of the photos does show this, so it must have been intentional. It looks ridiculous. I wish it had been made with a proper cover as I love the prompts, but I will not give this is as a wedding gift. This gift was special, and thought provoking. I believe my husband really appreciated the time and effort I put into it, and hope he puts in the time as well. I think my son and his wife will enjoy telling their story, a great keepsake.